A wonderful pair of vintage European neoclassical glazed terracotta planters. A hand-formed, traditional motif with circling, decorative, undulating ribbon detail and an exterior in variegated green glaze. Elegant botanical elements, great for use indoors or out. Due to the nature of this sort of craftsmanship, there are slight variations between the details of the planters, but the scale is the same. 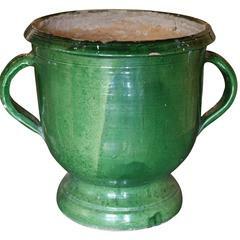 Green glazed terracotta planter from the South of France. Italian neoclassical terracotta planter. Antique rectangular planter with all-over fish-scale pattern, Italy, early 1800. 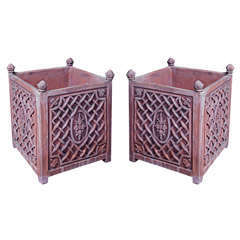 Dimensions: 18" W x 8" D x 7" H.
Pair of terracotta basket weave design planters. 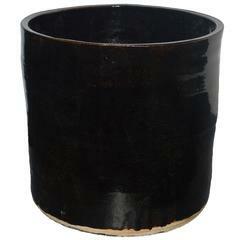 Artisan Series Glazed Terracotta Planter "Oscuro"
Large-scale vessels, hand thrown and glazed terracotta in California. 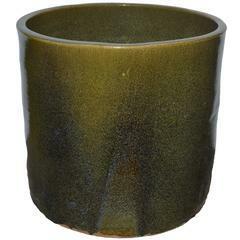 Artisan Series Glazed Terracotta Planter "Verde"
Large-scale vessels. Hand thrown and glazed terracotta in California.